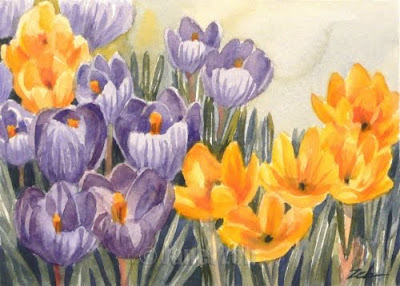 Colorful crocus will put you in the mood for spring. My flower beds are still covered with snow, but soon these little beauties will be popping up. This watercolor painting size 5"x7" is done with my current limited primary palette of one red, one blue and one yellow. Having worked with a more extensive palette for years, I am amazed by what can be accomplished with these three colors alone and it is interesting to continue to test what can be done. Purple colors are usually muted, but the bright yellow blooms in this piece make them come alive. See my art for sale at zehoriginalart.com and JanetZeh.Etsy.com. Thanks for stopping by!